We’re always excited to hear from our fans, even if it’s just to say “Thanks for making great beer!” If you have a question for us, we’d love to answer it. If you have an issue to report, let us know so we can fix it. Thanks for taking the time to share your experiences with us, as it will give us more information to keep bringing the best, high-quality craft beer to all of our fans… Cheers! Wir freuen uns immer von unseren Fans zu hören, auch wenn ihr uns nur Danke für wundervolles Bier, sagen wollt. Wenn ihr irgendwelche Fragen habt, beantworten wir diese sehr gerne! Falls es ein Problem gibt, lasst es uns wissen damit wir dieses so schnell wie möglich beheben können! Wir bedanken uns herzlich, dass ihr eure Erfahrungen mit uns teilt, um mehr Informationen zu sammeln damit wir euch weiterhin das beste high-quality Craft Beer zur Verfügung stellen können… Cheers! If you've found out-of-code beer, we'll work to get it replaced with fresh beer, ensuring that only the tastiest Stone beer is available in your area. 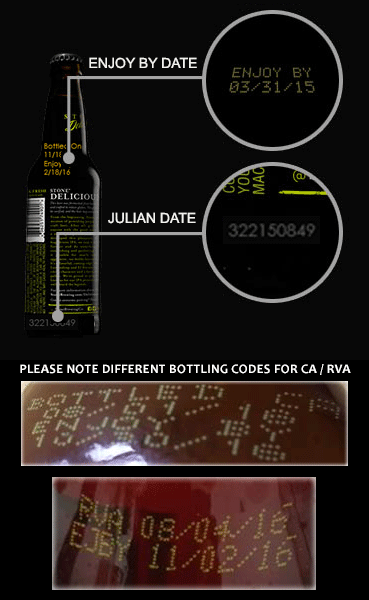 So check the date code on the shoulder of the bottle before you buy, and if it's expired, earn craft beer karma by reporting it here. WE NEED YOU IN THE FIGHT AGAINST EXPIRED BEER! NOTE: Retailers do NOT get in trouble for having out of code beer! This form simply allows us to make sure the situation is rectified. There's a chance we'll want to get in touch with you for more information, so if you'd like to, leave your information below. Thanks for taking the time to get in touch with us - these submissions ensure you'll always keep getting the freshest beer in your area. Please make sure that all the fields are correct, and don't forget the required fields before submitting. Notice an off flavor? Have a problem with a bottle or packaging? Find something else unusual? Tell us about it here so we can fix it! WE NEED YOU in the fight against the Unusual! We do all of our recruiting online, so check out our job board to find a position that looks like a perfect fit for you. Any available internships will also be listed on there, but if you don’t see the right job for you, keep checking back! Still have questions? Have a sales inquiry? Need help with something else? Let us know! If you didn't find the solution to your question or issue above, get in touch with us here.